are you ready for my next story? 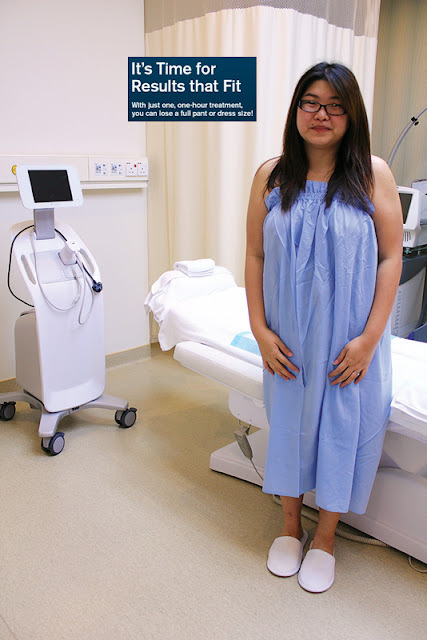 Today I would be talking about my experience going to Beverly Wilshire Medical Centre for the famed Liposonix treatment that would reduce me to a one size smaller with 1 treatment in 1 hour. Click here to read my Liposonix journey chapter 1. Well this is the continuation of that story where I would bring you through what actually goes on during the Liposonix treatment. Before I start, let me explain what Liposonix is about so you can get a clear picture of what I am about to go through. meet Dr. Liow Tiong Sin, he's going to make me slimmer today! Remember I said that I needed to be assess whether I was suitable for Liposonix and it turns out I was? I had 1 inch of fat on my tummy that qualifies me to go through, after a quick assessment with the nurses on my BMI and fat percentage. Leading me to the treatment room, I was in awe that it look like a scene in Men in Black. I meant the high tech, state of the art treatment room part and not aliens and strange surgical tools. Prep and ready, Dr. Liow Tiong Sin came in to have a quick check on me to make sure I was all set to go. Smiling, he told me he did the same treatment and joke about it. 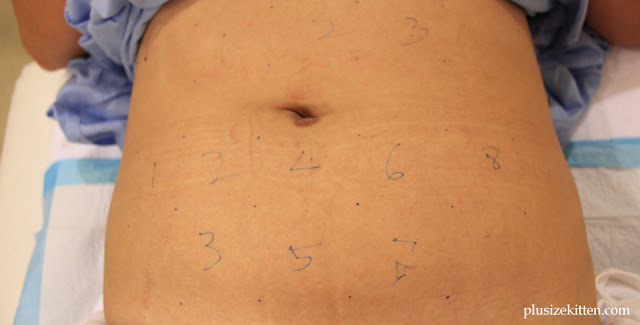 Marking the targeted areas on my tummy in "parts" which the Liposonix machine would focus on for 1 minute before changing areas. This goes on for 1 hour. in the process, I'm getting my fats burnt! I asked Dr. Liow Tiong Sin how he felt during his treatment? He said it would be different one to another, a person may experience discomfort, heat, pain, cold, trickling or warmth. During my treatment, I can honestly say I have never felt pain this way in my life. I was surprise that I could endure an hour of being in pain so I could lose that stubborn pouch I have been carrying for many years. I shall describe my pain here because I don't want to lie about it. Anyone who is interested should be prepared for this and not believe anyone who tells you it's not painful. Bless you if you have high tolerance for pain because I don't. Even during massages, I always go for the soft and relaxing massage techniques. Should the masseuse start pressing my joints and stretching me, I would immediately turn and show them the "NO" hand palm stance. If they continue anymore, I probably will slam dunk them onto the floor and make them feel pain. This is how upset I will get if people make me feel uncomfortable during massage. Back to my Liposonix treatment, the first few areas on my tummy was alright. I was tolerating the burning sensation, it was bearable. The nurse said the more fats I have the less pain I would feel. When it came to areas with less fats or sensitive (like a corner at your waist or the sides) I was in agonizing pain trying to wish it would be over soon. If I don't endure this, the treatment would not be successful in burning the fat cells off. It's the heat that's causing me to clench my teeth while holding tightly to a friend's hand. Reminds me of scenes where labor sets in and you're about to give birth you hold your husband's hands tightly. I started to curse uncontrollable when I couldn't take the pain anymore. This is how bad it would be for me, a person who can't stand pain and yet I still push myself to complete the treatment as promised. Hey since you felt so much pain, did you get any sort of bleeding or did your flesh burnt off? 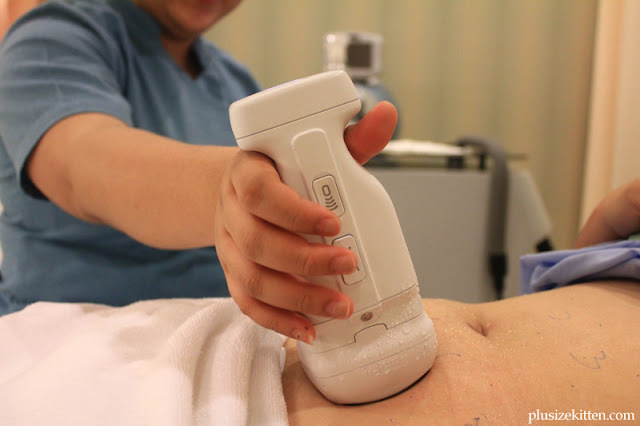 The Liposonix treatment does not destroy or affect any part of your skin while the ultrasound destroys the fat cells below it. 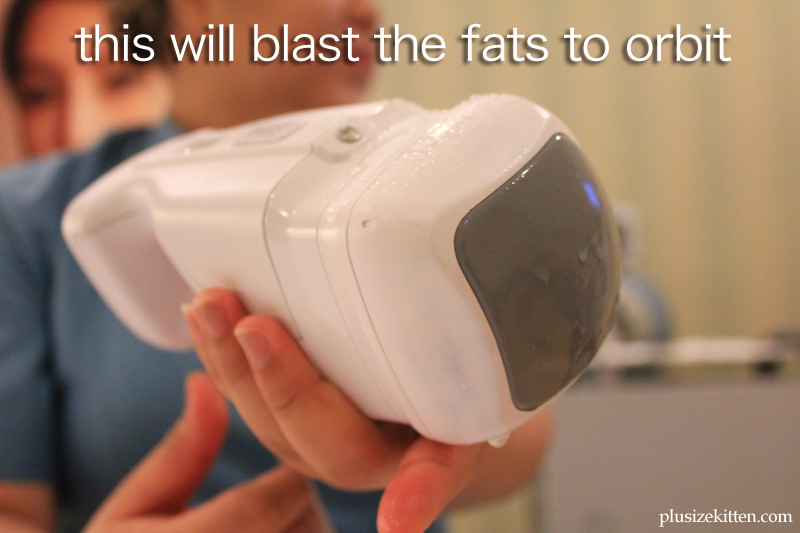 This is good news for those who has problem with stubborn fats in their body and do not want to go "under the knife". It has no downtown, meaning nobody will know you've gone through this treatment while you go on with your daily activities. No MC needed! you can do it during your lunch time and be back at work. Wait but what happens to the fats? The fats are destroyed by the high intensity ultrasound, the body will get rid of the fats via the liver to be process. I was advised to drink lots of water so it would get rid of the debris (destroyed fat cells) would flushed out of my system. The results will be apparent after 8 - 12 weeks. After an hour, I was so relieved and happy that the treatment was over! Despite the pain and burning sensation that I felt throughout the procedure, I saw that the targeted areas was intact! No bleeding or shockingly unnatural appearance. Slight redness can be seen on my skin and I felt thinner immediately! BUT I do feel pain, it was the sort of pain you get when you bruised yourself. The pain and swelling lasted for 1 - 2 months at the targeted area, which reminded me that I have proudly burnt my fats off without having to go for liposuction. Stay tune for part 3 of my story to see life after Liposonix, they say results can be seen after 8 - 12 weeks. Check out Beverly Wilshire Medical Centres website and facebook for a list of their treatments as they don't only do Liposonix. 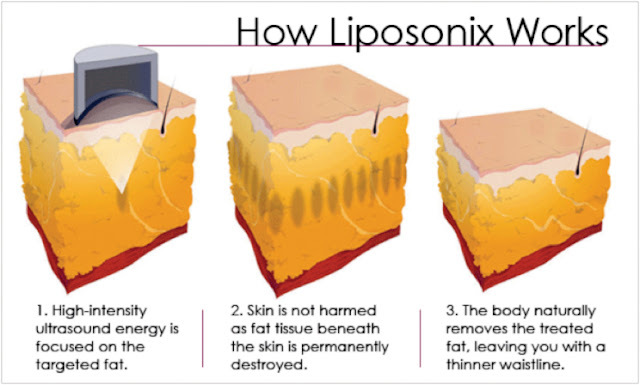 For more information about Liposonix click here. There's more details and images that what I just shared here. This is considerable more affordable & convenient than having to go through liposuction. Interesting... Bt the cost myst be expensive right? However when you compare to conventional slimming treatments at slimming centers, the price would be expensive but the results and procedure done are different. Omg...I'm like you, can't stand pain. But got lots of fat too. Not advisable to take pain killers before treatment? hmm pain killers only work up to an extend, i don't think it would help much. But knowing we have a hormone cycle, would advise not to do a week before or after period. We are more sensitive during that time. Ooo good point about the extra sensitive period (pun intended LOL). Well, some pain relief better than nothing nya. Especially during the treatment, since you said it hurt like h***. Lol. Might work! Yesh....how long has it been already? When will 8-12 weeks be? Haha I cant stop laughing when u described your preferred massage techniques. I so U!! But I think I still can tolerance a medium pain. Hmm if the cost is not very expensive, really tot of trying. Anyway will wait for your 3rd part. Tq for introduced the Liposonix treatment! Hey Maggie.. hahahahhaa!!! I thought nobody get it... but u did! Liposuctions would cost more than RM20k per session and you go through all that pain and downtime. Liposonix is considerably cheaper, it's RM12k for 1 time only. Those who don't have stubborn pouches or fats and has consider liposuction, might be more inclined to go for liposonix. Omg lololol "If they continue anymore, I probably will slam dunk them onto the floor and make them feel pain." That is EXACTLY what I'm like! So whenever I go to those Thai massage places with my parents (I ONLY go with them around) they'll have to be the one to tell the women to go super soft on me cos I actually can never tell them anything... too scared to look impolite. Imagine my face all pinched in agony but smiling and nodding at them when they look up and ask "OK??" But believe me I'm slam dunking them in my head. Oh no why!! i didn't think you're the shy type to do that!!! we should totally wear shirts that say "ME NO WAN PAIN MASSAGE" when we go spa. Let's go training together n get some balls to say NOO VERY PAIN!! I must say I really admire your courage....It looks a little scary to me..
i think bloggers have a certain amount of courage hahhaa... for me, I would always like to try new experiences if I have the guts! omg! u went for the treatment!! ngek ngek wanna see the result in person!! Thanks for sharing. I love your blog. 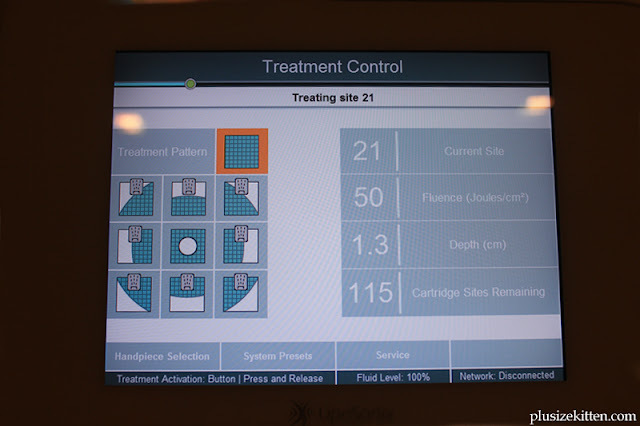 How do you compare Liposonix to your HCG program? Looks like Liposonix is a spot treatment on the tummy only, HCG is overall fat loss - would that be right?? Anyone heard about coolsculpting? I wonder which gives better result and the cost.